Annual Parish meeting of the Parish Council 18th Apr 7pm Village Hall. See you there. 28,027 page views over twelve months, updated daily. Garden of Remembrance is an area of the cemetery where ashes remains can be interred. This section is to the left of the entrance of the cemetery. There is currently space for 130 ashes plots. Burial Rights are available on a consecutive number basis. With effect from April 2012, all ashes plots from Row 9 onwards are for an 460 mm (18 inch) square plot. Two sets of ashes can be interred in each ashes plot. 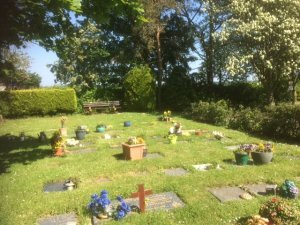 Memorial plaques for Row 9 onwards are to be a maximum of 18'' square and the top surface is required to be sunken into the ground so that it is level with the surface of the grass and must be in line with existing plaques. Double plaques are not permitted from Row 9 . Burial Rights for the Garden of Remembrance are for a period of seventy five years and are effectively a form of lease. The land remains the property of Little Paxton Parish Council at all times. A memorial plaque may be erected two months after the interment. Permission is required for memorial plaques including added inscriptions. No items other than flowers may be placed on memorial plaques. Stones, plants etc. are not permitted around the plaque. Outdoor activities at Gatekeeper Walk and Little Paxton Pictures. HTML5 validated. WCAG compliant. Page generated in 0.0623 seconds.